For our royal subjects, let them open their castle doors with this stunning crown keyring favor! 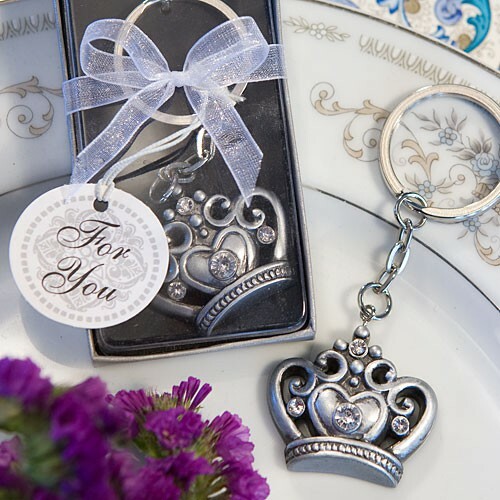 Each time they reach for their keys they will think of you and how very special you made them feel with this fun and functional keepsake! Each measures 1 1/2" x 3"and has a durable pewter finish poly resin crown charm, with cutout ornamental detail and glistening clear rhinestone accents, attached at its tip to a silver metal chain and ring. Packaged in a clear topped box with a silver bottom, tied with a white organza ribbon and an attached silver filigree design "For You tag.